“I’m sorry.” That was a message I delivered on Sunday to the students of Lancaster University, speaking as as a representative of my generation (I’m 48). “We’ve made a right mess of things.” In Britain, and around the globe, we’ve got three crises all coming together at the same time: our economic, social, environmental systems are all failing. There is another way. There is an alternative. The Green Party Election Broadcast for the Local Elections and London Elections on May 3rd 2012. Help us Make The Difference. Produced and promoted by Martin Bleach on behalf of Jenny Jones and London Green Party candidates, all at Development House, 56-64 Leonard Street, London EC2A 4LT. The UK Huffington Post has this piece about popular Green Party Member of Parliament Caroline Lucas in the United Kingdom. Lucas is the first Green to get elected to Parliament in the UK. Shortly after making history, Caroline Lucas gave a speech on Glastonbury’s pyramid stage, called for drugs to be decriminalised and won the Spectator’s much-coveted parliamentarian of the year award. It’s been a busy year for Britain’s first Green MP – and she’s not planning to slow down. Her next project is shaking up the green movement, who she admits have “failed a little bit” to engage the public. For her, the green movement is about improving people’s lives – tackling the problem of fuel poverty, creating jobs and growth. “Instead of just saying ‘we’ve got to act because climate change could be dreadful’, we’ve got to act because this could be a way of creating lots of jobs and also insulating lots of people’s homes and reducing their fuel bills so they’re not living in poverty and dying prematurely. Sitting at a desk crowded with annotated print outs from bill sub-committees she speaks quickly, offering to help clarify quotes if my dictaphone can’t pick up it all up. The sense of urgency is understandable. For Lucas, climate change has been relegated down the political agenda – and it’s up to her to tackle that within parliament as the most powerful representative of the green movement in the country. “It’s just crazy”, Lucas says, that the Government aren’t instigating a 1930s style New Deal for green energy. She believe it comes down a Catch 22. Lucas thinks the politicians are waiting for the public pressure to act, whilst the public assume if it were serious the politicians would be acting already. Membership of the Young Greens increased by 10 per cent in just one weekend after Parliament voted to treble the cap on university fees in England to £9,000 per year. The organisation, which is the youth wing of the Green Party of England and Wales, says that students and young people are abandoning their traditional support for the Liberal Democrats. Students have expressed anger over the decision of 28 Liberal Decmocrat MPs, including the party’s leaders, to back the fee hike in a Commons vote last Thursday (9 December). Prior to this year’s general election, every Liberal Democrat MP pledged to vote against increase in fees. On Friday, the day after the vote, the Green Party offered free membership for a limited period to students of any age and to people under 30. A similar offer was made by Plaid Cymru. The Young Greens say there was a 10 per cent increase at the weekend, with 40-50 people joining in an hour at the busiest periods. Over 400 young people have joined the Greens since the vote in the Commons. She also countered the government’s claims that rises in tuition fees are the only way to fund the gap left by the 80 per cent cut to the teaching grant given to universities. The Young Greens have also responded to the reports that the police have used excessive force in the recent tuition fee protests by launching a petition that calls on the Metropolitan Police Authority to ban the practice of ‘kettling’- confining groups of protestors in small spaces and refusing to allow them to move, often for hours at a time. With the United Kingdom set to elect a new parliament on May 6th, the UK Green Party has something to be encouraged about: Green Party policies are the most popular of the six largest British parties in an online survey that matches respondents’ views to party platforms. Currently, Green policies have 25% support from over 224,000 respondents at Vote For Policies. The UK Green Party is aiming to win its first seat in parliament this year. 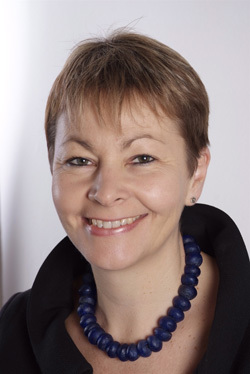 Caroline Lucas, the party’s leader and member of European parliament, is favored to win in Brighton Pavilion. Adrian Ramsay in Norwich South and Darren Johnson in Lewisham Deptford are also considered to be in the running for parliamentary seats. Tony Juniper in Cambridge has also climbed in recent polls. Unlike many other European countries, the United Kingdom doesn’t have proportional representation. Rather, members of parliament are elected using first-past-the-post, the same system used for the US Congress (although the UK doesn’t suffer from anti-competitive ballot access laws of the kind that plague the US). There are hopes that this may change if neither of the traditional two big parties, the Conservatives and Labour, wins a majority in parliament. The Liberal Democrats, Britain’s third largest party, have a chance to make up the balance of power, and they may demand a switch to proportional representation as a condition of their support for a coalition government. Best of luck to the UK Greens from your mates across the pond! The Green party is fielding a record number of candidates at the general election amid hopes it will win its first parliamentary seat. eGov monitor has an excellent story on the UK Green Party’s plans to field over 300 candidates in the 2010 general elections, including the party’s first full slate in London and 3 candidates who are favored to become the Greens’ first members of parliament. Unlike other European states like Germany and France where Green parties have flourished in a democratic system using proportional representation, the United Kingdom elects its parliament using plurality or “first-past-the-post” voting. Therefore, the electoral growth of the UK Green Party should be of special interest to Greens in America, where Congress and state legislatures are still elected with first-past-the-post voting.